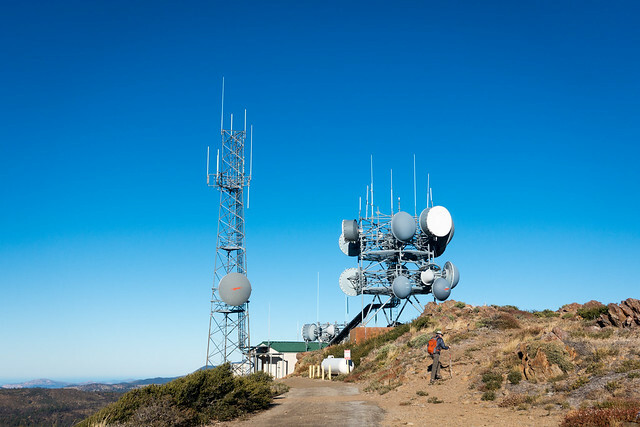 I've never been up Monument Peak, though it's really accessible: just head east of San Diego about an hour, drive up past Mt Laguna on the Sunrise Highway, park next to the road, and start walking. It's not even an hour's walk to the top, and on this bright sunny dry day, we could see downtown San Diego and the Pacific Ocean, the Salton Sea, Mt San Jacinto, and even Mt San Gorgonio--and all from the same spot. After that, we walked through the now-removed remnants of Mt Laguna Air Force Station, walked along the PCT for a few miles under the yellow-leaved black oaks and pines to Thing Valley Road, and then made our way back to the car via the Red Rooster and Big Laguna trails. It was a fairly fast 11.5 mile hike, and good change of pace from the more typical hiking around Big Laguna Meadow. We did leave early at 7, and by 8 we got to the trailhead parking, across from the fire station driveway--though we should've driven a tiny bit more, to the Big Laguna parking lot about 1/4 mile further--we realized that when the trail just seemed a bit too overgrown. 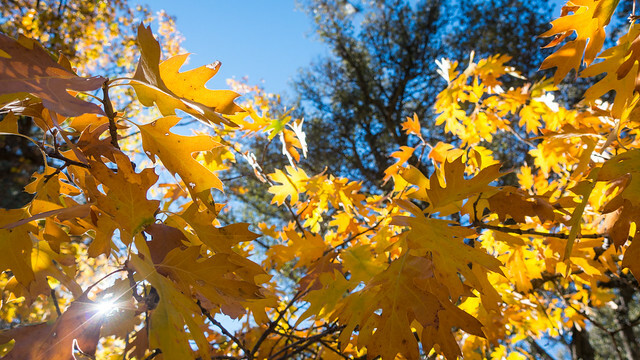 The air was cool and dry, and it was calm as we hiked east into the rising sun, through chaparral and oaks and pines, the oaks changing color and actually making me feel like we were hiking in autumn. The use trail joined the Big Laguna Trail, then 400 yards further it intersected the PCT; we headed north, not quite sure where the actual Monument Peak trail was, but I'd remembered it went up the northwestern side. I brought up the AllTrails app and looked at a map, aha, there it is, and wow that app has gotten a lot better. We followed a paved road and soon enough we were on top with all the microwave relay dishes and radio antennae and that, looking out west towards San Diego and downtown buildings, and east towards the Salton Sea, where we could see the white steam plumes from the geothermal power plants on the southern shore. But what was to the north? There's Palomar Mountain, you can see the white dome of the observatory. And to the right, is that San Jacinto? Yep. And behind, is that San Gorgonio, even? Yep. It was fantasic to be able to see so far, while the antennae are a bit of a blight, this mountain has great views. 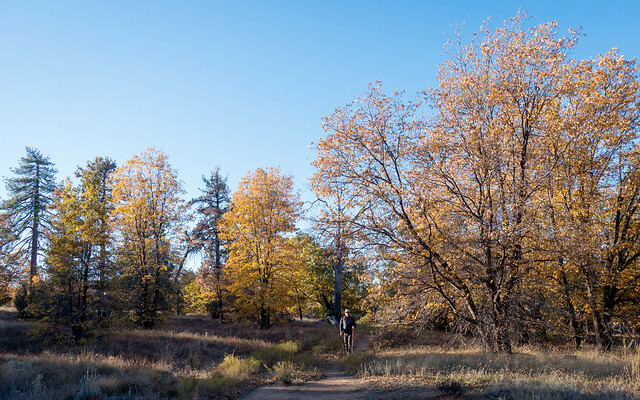 From there, I wanted to head south along the PCT to pick up a tiny little section I missed on my third day when I detoured into Mt Laguna for supplies. First though, we headed south from Monument Peak along a paved road towards the site of Mt Laguna Air Force Station, an air defence installation that looked for incoming Soviet missiles or something. A few years back, all the buildings were removed, leaving just a few non-native plants to mark where dozens or maybe hundreds of people lived. We rejoined the PCT just below the base, and rested at the Desert View picnic area, right at the table where I repacked my pack and rested a few minutes. This was the northern end of a small section of the PCT is one I didn't hike back in March--the section between this Desert View picnic area and the Burnt Rancheria campground, is about 1.2 miles in length, and if you detour into Mt Laguna for supplies at the campground, it's just shorter and easier to continue walking north a few hundred years to the picnic area to rejoin the PCT. For PCT thru-hikers, I see it as their first purity test: if you go into Mt Laguna, and most hikers do, are you going to backtrack to do "all" of the PCT, or are you going to rejoin the PCT and skip that mile-long segment? If you start the PCT at the border in Campo, you'll be three or four days out, and will have plenty of time to think about your decision. For me, I knew I'd skip that segment... and pick it up later, with "later" really meaning today. Today was warmer than March, and the pinkish just-budding leaves of the black oaks had turned green and now were yellowing. There were no other hikers on this mellow PCT section, save a couple with their dog, and no mountain bikes though there were a lot of tire marks. We turned off at Thing Valley Road, made our way west across the highway, taking a short break at the Red Rooster volunteer center/fire station. The way back to the car was a bit busier--a few amusing mountain bikers packing up in the parking lot, a group of hikers stopped for lunch--but nothing really of note, just a pleasant walk back to finish up the hike, which ended up being 11.5 miles. I was feeling a bit draggy at the end, not exhausted but rather just weary, and was happy to have a seat. Coming down the mountain we stopped at Alpine Brewery's new pub-restauarant off Tavern Road (uh, if you go there it'll be for the beer not the food), and then scooted back home. A good day.